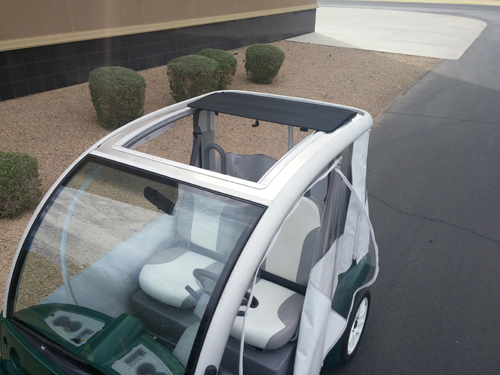 This ragtop style sliding top fits 2 passenger Ford Think Neighbor electric cars. The opening size measures approximately 33" x 25". It provides a nice big sliding ragtop similar to classic sunroofs. If you like sunshine you can't beat our Ford Think sliding ragtop sunroof. Our sliding ragtop is specifically made to match the Ford Think's special roof curves. Install our frame from the top and tighten it down with supplied hardware.